“God Part II” was released as a promotional single to radio at about the same time “When Love Comes to Town” was released as a commercial single. 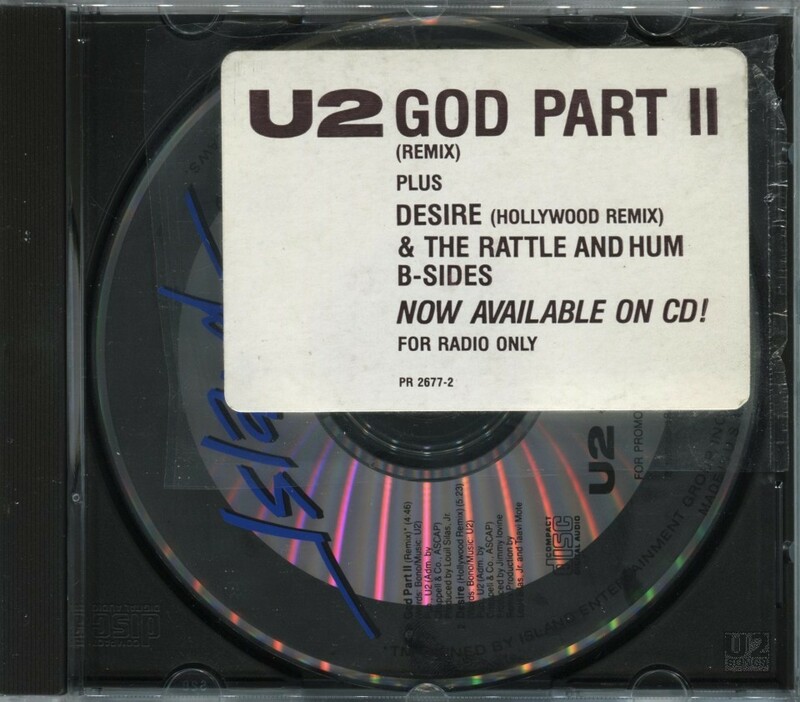 The promotional single for “God Part II” was released in a regular jewel case, but without any inserts. On most copies there is a sticker affixed to the front of the jewel case announcing the title of the CD as well as the track listings. This sticker said “U2 God Part II (Remix) plus Desire (Hollywood Remix) & the Rattle and Hum B-Sides. Now available on CD! For Radio Only” as well as the catalog number. On the CD itself the version of “Hallelujah Here She Comes” is labelled as the Hollywood remix. But it isn’t a remix. The song is the same as found on the B-side of the “Desire” single. Words by Bono. Music by U2. Produced by Lou Silal Jr. Recorded by Dave Tickle. Mixed by Dave Bianco at A&M Studios, Hollywood. Assistant Engineer: Randy Staub. Programming by Jeff Lorber. Produced by Jimmy Iovine. Remix production by Louil Silas Junior and Taavi Mote. Remix Engineer: Taavi Mote. Assistant Engineer: Andy Batwinas. Additional production and Programming: Jeff Lorber. Backing vocals: Alexandra Brown and Edna Wright. Remixed at Larrabee Sound. Written by U2. Produced by Jimmy Iovine. Engineered and mixed by Dave Tickle and Mark Desisto. Special thanks to Billy Preston for additional vocals and Hammond Organ. Words by Bono. Music by U2. Produced by Jimmy Iovine and U2. Recorded by Dave Tickle. Additional recording and brass by Paul Barrett. Assisted by Ian Bryan and Willie Mannion. Mixed by Paul Barrett. Backing Vocals: Maxine Waters and Julia Waters. Words by Bono and Bob Dylan. Music by U2. Produced by Jimmy Iovine. Recorded by Andy Rose on the Fleetwood Mobile, at the Smile Jamaica concert, Dominion Theatre, London, Sunday October 16th, 1988. Mixed by Dave Tickle. Guitar by Keith Richards. Vocals by Ziggy Marley and the Melody Makers. Horns by the Rumour Horns section. All proceeds from this song are donated to the Smile Jamaica Fund. Written by Patti Smith and Ivan Kral. Produced by U2. Engineered and mixed by Paul Barrett at STS Studios, Dublin. Assisted by Ian Bryan.